Proper care of your contact lenses, storage cases and eyes is essential to keep your eye’s health in the best shape possible. After a fitting and examination your eye care professional will give an instruction booklet, describing exactly what is necessary for you to do on a daily, biweekly and monthly basis. The best source of information comes from the FDA. Even your eye care professionals get their information from the FDA. You should follow safety guidelines to a T when caring for your or your child’s contact lenses. If you are unsure about anything, you can look it up online 24/7 by visiting www.fda.gov. Or to request another instruction and/or information booklet you can contact your lens manufacturer website. They have information on just about everything you can think of, including solutions, cases, and other optical products you can benefit from. Below are some common mistakes made by contact lens wearers. There are also tips and suggestions to help you look at the big picture. The most common mistake among contact lens wearers is improper daily care of them. The fun doesn’t stop after the cleaning and disinfecting process. Properly storing them in clean and disinfected storage cases is just important. There are many dangerous creatures that grow and live in storage cases that can harm your eyes even more. Wearers who are prescribed continuous wear lenses think they are exempt from the daily cleaning process. The opposite is true. Even though these lenses allow you to keep them in overnight, it’s often a bad idea to do so. Nor is it a good idea if you swim, shower or involve yourself in water activities while wearing contact lenses, regardless of the wear-time prescribed. Another common mistake people make when buying lenses is that they want to have them right then. So they look to places like swap meets or flea markets to avoid the waiting time. But buying lenses from anyone who is not asking for a prescription or a copy of a prescription can be a bad idea. This should raise a red flag immediately and these types of dealers should be reported to the proper authorities. NEVER buy contacts without having an examination and fitting done first. Infections, abrasions and even blindness can result. One more issue many people don’t consider is the reliance on contact lenses to protect your eyes from the sun. Make sure to use sunglasses that block ultraviolet light. Even though lenses such as Acuvue Oasys include UV protection in the lens, it’s no comparison to the protection you can receive from prescribed sunglasses. Never swap contact lenses with another person. Swapping is just another way to transfer germs between people. Contact lenses are individually fitted. Incorrectly fitted lenses may cause permanent eye injury, infection and may potentially lead to blindness. Even though you follow procedures exactly and do everything you can to ensure you’re taking proper care of your lenses, there are few extra things you can do to ensure you’re taking the proper care of your eyes. 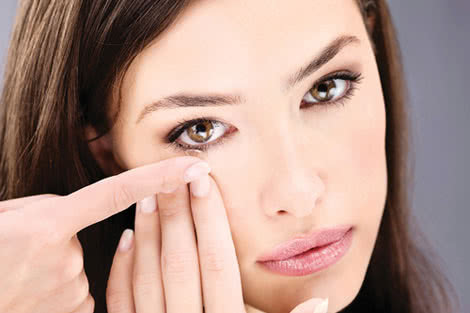 If you wear makeup, apply your cosmetics after inserting your lenses and remove your lenses before removing makeup. This will help reduce the likelihood that bacteria and other particles from your makeup from being transferred to your lenses and your eyes. Also apply any aerosol products like hairspray, cologne, and deodorant before inserting lenses. Another way in which to ensure healthy eyes is to get annual eye exams. During the span of one year, the health of your eyes can change dramatically, either for the better or the worse. This could be a great time to ask for a new pair of glasses. Having a back-up pair of glasses with a current prescription in the event that you have problems with your contact lenses is a great idea. Replace contacts as recommended by your eye care professional. Throw away disposable lenses after recommended wearing period. There are reasons why contact lenses have expiration dates. And you should always ask your eye care professional before using any medicine or using topical eye products, even those you buy without a prescription. Some medicines may affect your vision or irritate your eyes. Don’t smoke, and if you do really consider quitting. Studies show that smokers who wear contact lenses have a higher rate of adverse reactions than do nonsmokers. Of course, smoking can lead to other serious health problems. Remember, if you’re unsure about care routines, solutions, proper storage cases or any optical products, and don’t know what to do or how to do it, information is available. Also, if you feel like you’re witnessing unsafe and unethical practices by any contact lens provider or seller, contact the proper authorities as soon as possible.